Find a vacation home to rent in Gotland County from our list of vacation rental properties. Campaya has over 150 vacation homes available in Gotland County, which give you the possibility to locate a unique accommodation in Gotland County which completes your check-list in search for the perfect self catering vacation apartments in Gotland County or vacation villas in Gotland County. This holiday home is situated in Sudret near artisans’ workshops and a lively village. Sandy beach located here is ideal for the entire family. This fascinating, modern holiday home has all comforts. This home has a sophisticated room plan and is very spacious. Large windows of this home provide gorgeous lighting. This holiday home is 400 metres away from a sand beach. Ljungarn is a much coveted holiday destination with various shops, cafes, several restaurants and the rock formations of Folhammer. The house has a thoroughly high quality, especially in equipment and furniture. It is secluded and has a wonderful terrace for sunny days and gepfelgtem al fresco dining. This comfortable holiday home situated in a secluded location is surrounded by nature. Nice semi-detached house with views of the sea. The house is located just 100 meters from the sea at the fantastic coastal Ekstakusten. Large windows facing the sea. This beautiful holiday home is situated in the lovely Grynge Gammelgarn. The sea is located in your neighbourhood; there are beautiful beaches and nice old fishing villages. This holiday home is one of the 6 terraced houses situated in Burgsvik on the seafront. You can rent three homes in these 6 homes. The apartments are nice and very inviting. 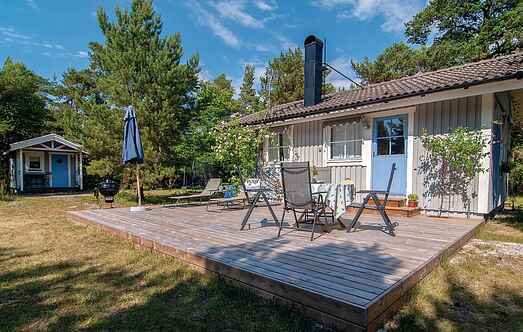 This comfortable holiday home is located about 10 minutes north of Visby in Gotland. This home is located near the famous Lummelunda Caves and several farms that sell handicrafts. This leisure home is situated in the seaside resort Tofta. Tofta has first class beaches. The spacious house has a large terrace for perfect open air dining during sunset. This holiday home is located a kilometre away from the pastures of Mästerbys with tall oak trees and numerous varieties of birds.